When it ought to be raining, it's raining pink. They say you can't fool Mother Nature or outsmart Father Time but that's not the case in the UC Davis Arboretum. 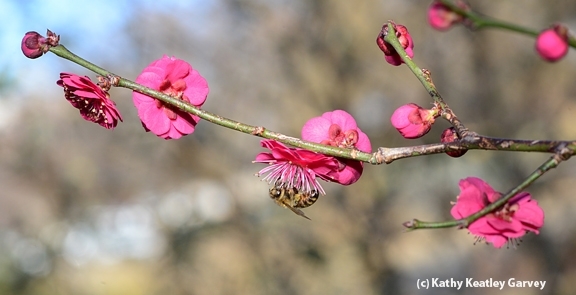 A red Japanese apricot, Prunus mume "Matsubara red" glows with absolute radiance in the Storer Garden. It's a early bloomer, but this year it's really early due to the springlike temperatures. We first noticed it blooming Jan. 5. 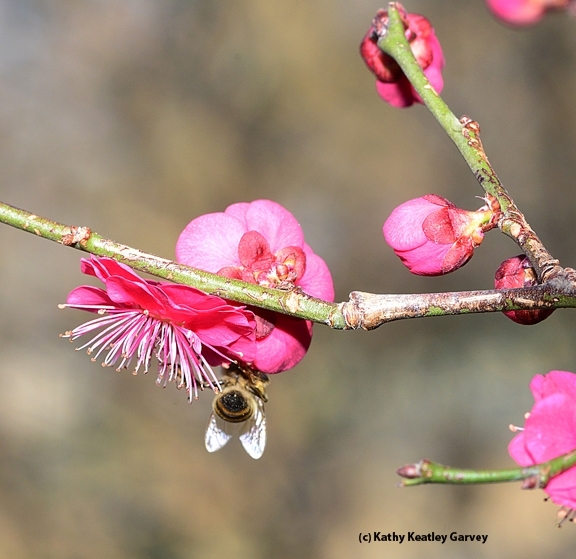 It's still blooming, and honey bees--probably from the Harry H. Laidlaw Jr. Honey Bee Research Facility on Bee Biology Road--are all over it. 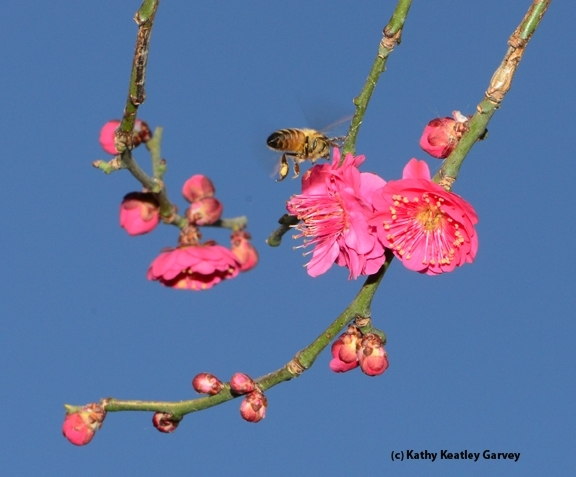 The flowering apricot bears the name "red Japanese apricot," but its origin is China and Korea. It's been cultivated in Asia for some 500 years. If you've never been to the Storer Garden, you should go. As it says on the Arboretum website: "The Ruth Risdon Storer Garden is a Valley-wise garden, featuring flowering perennials and small shrubs that are especially well suited to Central Valley gardens, including many Arboretum All-Stars, our recommended plants for Valley-wise gardens. It is designed for year-round color with low water use and low maintenance, and features a demonstration planting of roses and companion plants. Educational exhibits highlight the principles of sustainable gardening. The garden is named for Dr. Ruth Storer, Yolo County’s first pediatrician and an avid gardener." 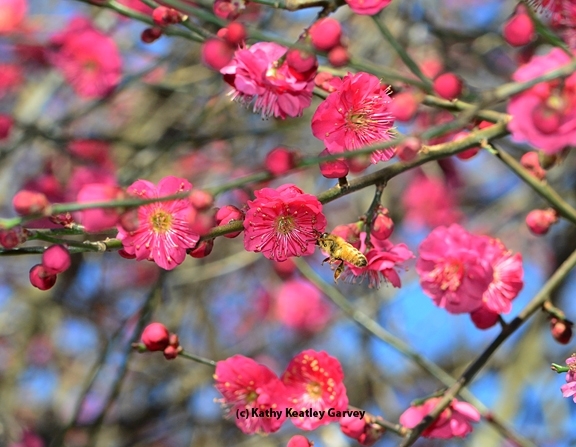 For most of January, it's been raining pink in the Storer Garden. Now we need the wet stuff.